Strong winds whip thick clouds of dust across the Bolivian highlands in this photo-like image from July 18, 2010. 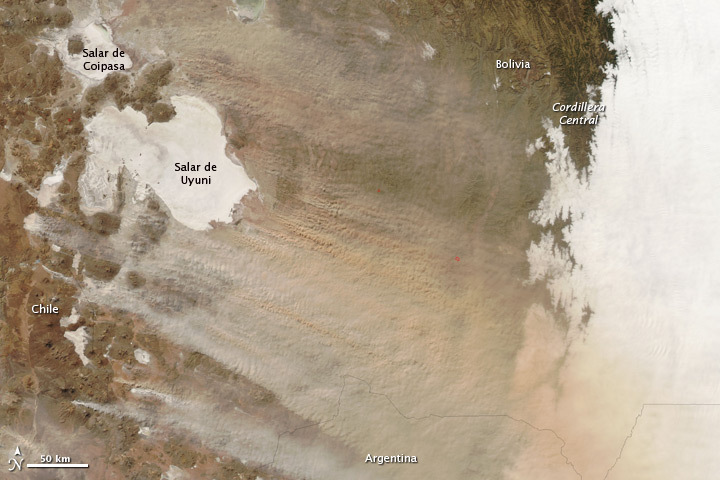 Much of the pale dust along the southern edge of the storm is coming from small white spots, salt pans (dry lake beds), south and southwest of Salar de Uyuni, but little or no dust appears to be blowing off the large salt pans, Salar de Uyuni and Salar de Coipasa. Instead, the dust is multicolored, pointing to a variety of different soil types. 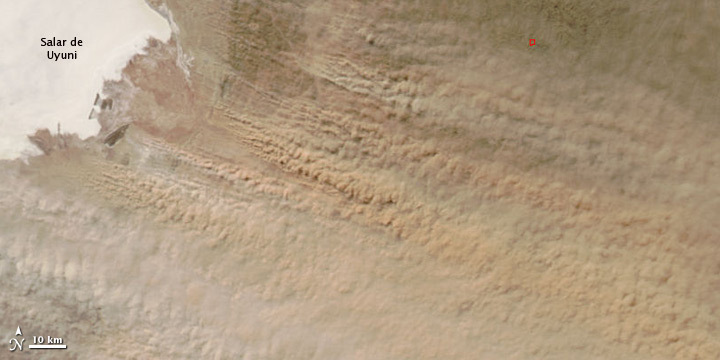 The lower image provides a closer view of the dust storm east of Salar de Uyuni. Plumes of dust seem to be coming from a variety of points east of the giant salt pan. Though the region is typically dry, El Niño brought even drier conditions in late 2009 and 2010. By July, much of Bolivia was in the grip of severe drought, particularly in the southeast. The lack of rainfall may have contributed to the dusty conditions seen in the image. Salt pans and other dry water features are among the most common sources of dust in the world. The dust blows east over the Altiplano, the high plain between ridges of the Andes Mountains. Though much of the Altiplano is hidden beneath dust, the region’s distinctive salt pans are visible. The bright white salt pans are dry lakebeds coated with salts and other minerals left when water evaporates. The Salar de Uyuni is the world’s largest salt pan, covering approximately 8,000 square kilometers (3,100 square miles) of the Altiplano. The Cordillera Central, or Central Mountains, define the southeastern edge of the Altiplano. The Bolivian Chaco, a flat, semi-arid grassland/savanna, extends east from the mountains. 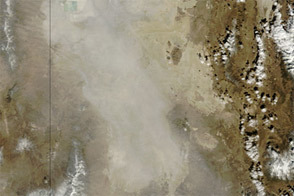 In this image, the Chaco is covered in a sea of low clouds that seep into mountain valleys along the Cordillera Central. With an elevation more than 3,659 meters (12,000 feet) above mean sea level, the Altiplano is much higher than the Chaco to the east. 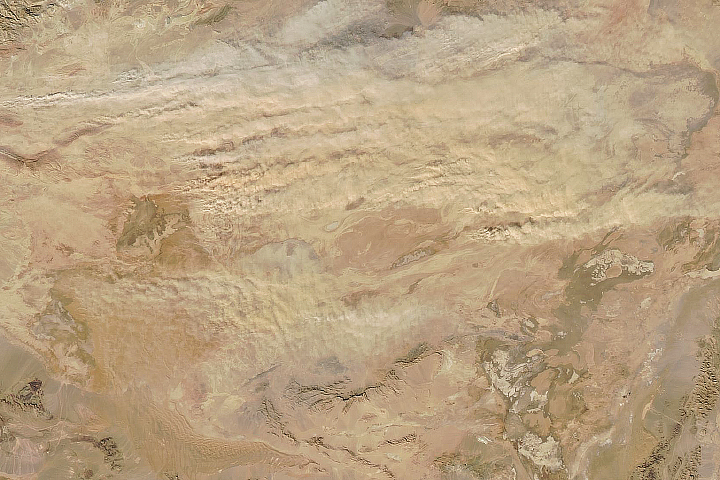 Dust from the high Altiplano soars over the mountains and clouds in the southeast corner of the image. The Moderate Resolution Imaging Spectroradiometer (MODIS) on NASA’s Aqua satellite acquired this image on July 18. 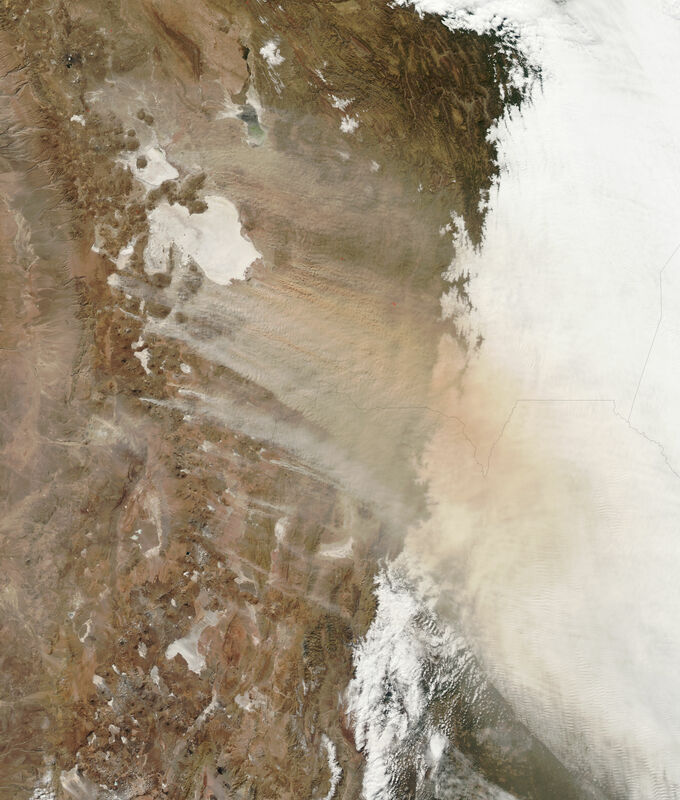 The large image is the highest-resolution version of the image, but the image is available in additional resolutions from the MODIS Rapid Response Team. Strong winds whip thick, multi-colored clouds of dust across the Bolivian highlands in this photo-like image from July 18, 2010. Earth Observatory. (2005, December 12). Salar de Uyuni, Bolivia. NASA. Accessed July 19, 2010. Food and Agricultural Organization of the United Nations. (2010, June 21). GIEWS Country Brief: Bolivia. Published on ReliefWeb. Accessed July 19, 2010. Office for the Coordination of Humanitarian Affairs. (2010, July 5). REDLAC weekly note on emergencies Latin America & the Caribbean. (pdf) Published on Relief Web. Accessed July 19, 2010.